Sustainability is a buzzword in construction, manufacturing, and every other industry today. Fundamentally, sustainability is the idea of managing our resources so that future generations have access to those resources. Naturally, this idea brings with it the desire to utilize recycled and renewable materials. Yet in construction, sustainability can also be addressed through dramatically increasing the expected life cycle of the built environment. By designing our structures to last two to three times longer than our current designs, we can alleviate the need to rebuild those structures as often. Concrete is a relatively versatile and durable material. Globally, concrete is used over twice as much every year than all other building materials combined. Unfortunately, concrete structures are being rebuilt or repaired far too often. All concrete is permeable to some degree, allowing water, gases, and deleterious substances, such as chlorides, into structures where life-shortening damage occurs. The durability of most concrete has a direct relationship with its permeability; as permeability goes up, durability goes down. 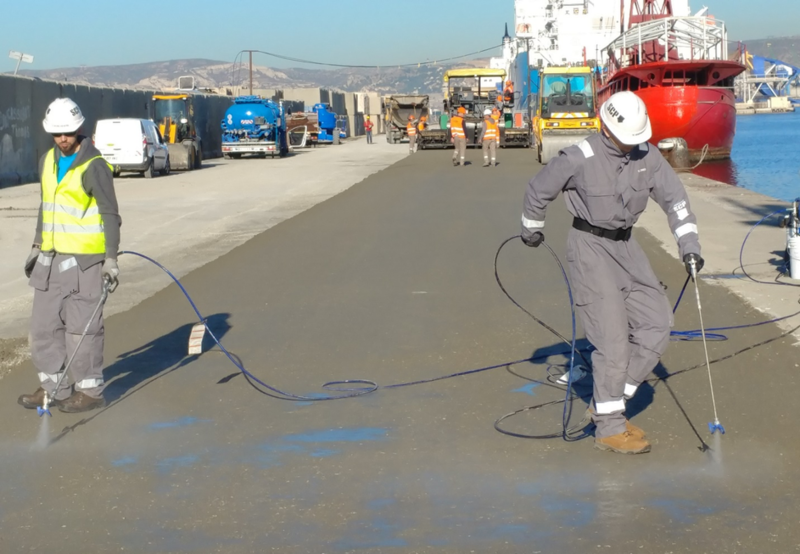 Spray-Lock Concrete Protection (SCP) helps improve the durability of concrete with a colloidal silica product that enters the concrete through capillary voids. Once inside, the colloidal silica reacts with calcium hydroxide to form more Calcium Silicate Hydrate (C-S-H), essentially filling the capillary and pore structure with more concrete. This action dramatically reduces permeability for the lifetime of the concrete. Using life cycle modeling software, laboratory-derived permeability parameters can be set to reflect the improvements to permeability gained with SCP products, and comparisons can be made between untreated concrete and concrete that has been treated with SCP Technology. These comparisons can estimate a percentage in life cycle expectancy gained with the use of SCP products. Often, concrete life expectancy can be increased two or three times with the use of SCP products. For example, a bridge in a marine environment may be expected to last 30 years. After treatment with SCP Technology, the permeability of the concrete can be reduced to elevate the life expectancy to 60-90 years or more. Sustainability means more than just using recycled materials. If we can provide the tools to make the concrete built environment last longer, then we can reduce overall raw material usage. If life cycle of the structures you design and/or build is important, contact us to learn more about how SCP can help. SCP’s technical staff can work with you to help get the most out of your concrete structures.